Macau Golf and Country Club is one of the most beautiful golf courses in Macau. Located on the southern end of Coloane Island, besides the Westin Resort, the 18-hole golf course is surrounded by beautiful luxuriant landscapes. The golf course is open for both locals as well as foreigners. Besides the golfing attraction, its strategic location, over viewing the Hac Sa Beach and Pearl River provides a charming experience. The beautifully laid out golf course blends naturally with the country's environment. 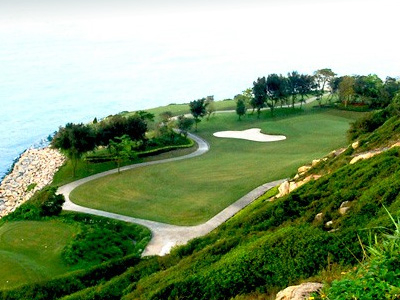 The slopes of the hills and cliffs offer an exciting and challenging round to the golfers. Macau Golf and Country Club has successfully hosted several international competitions including the Macau Open and it has even received excellent reviews from many professionals. Some of the best international amenities like Pro Shop, restaurant, bar and spa are also provided at the club. Here's the our members favorite photos of "Golf Courses near Coloane Islands". Upload your photo of Macau Golf and Country Club! Category:Golf Courses in Coloane IslandsHelpful Links:Coloane Islands Overview References: 007152, 018370 Claim:If you are the owner of this property claim it?